The contest was featured in August at the NAD Teacher’s Convention in Chicago, Illinois. Young filmmakers have several months to create their masterpieces. The entries will be placed on the Adventist Mission website and social media for public voting in April 2019. The first-place winner can look forward to honing his or her filmmaking skills with a Canon M100 Mirrorless Camera with lens. The winner’s mentor of choice (teacher, pastor, etc.) will receive a 1-year online learning subscription to either MasterClass or Skillshare. The second-place prize is a LitraPro Bi-Color Light, and the third-place prize is a Langly Simple Camera Bag. The Office of Adventist Mission is part of the General Conference of Seventh-day Adventists and serves to inspire Adventists around the world to support mission work and live mission-focused lives. 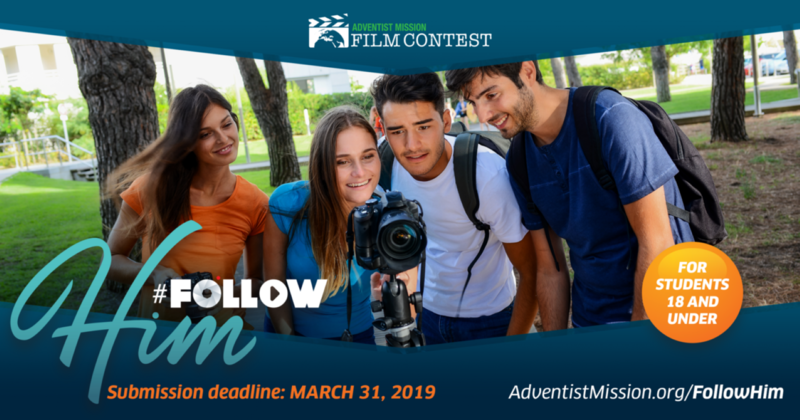 If you would like more information about this contest, please contact the Office of Adventist Mission by email at questions@adventistmission.org. Full details and rules are on AdventistMission.org/FollowHim. This article originally appeared on the Adventist News Network® the official news network of the Seventh-day Adventist world church. Image courtesy of Adventist Mission.